As the limit of my crochet capacities seem to lie in the blankets department, recently I have felt like trying something new... something wearable. So I found this pattern for a little crochet cardigan (crochetted all as one piece - apart from the arms - which is fab and easy) and I have since made three cardies for Nina. 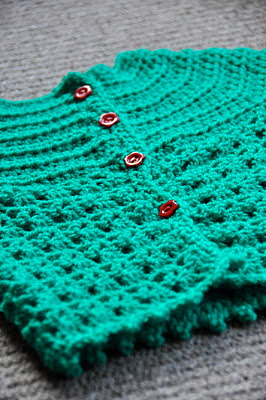 If you are feeling brave, you can adapt the pattern to make the cardi bigger or smaller. Round 1: Single crochet (sc) in second chain (ch) from hook and in each ch across. (42 sc). Ch 2, turn. Round 13: Hdc in first 7 hdc, 2 hdc in next hdc, hdc in next 7 hdc. Chain 7. Skip next 19 hdc, Hdc in next 10 hdc, 2 hdc in next hdc, hdc in next 10 hdc, 2 hdc in next hdc, hdc in next 10 hdc. Chain 7. Skip next 19 hdc. Hdc in next 7 hdc, 2 hdc in next hdc, Hdc in next 8 hdc. Turn. Round 14 (v-stitch round): Chain 3. Dc in next hdc, *sk next 2 hdc, v stitch in next hdc** repeat from * to ** 3 more times. Skip the next hdc, v-stitch in 1st chain stitch of right armhole, sk 2 ch, v-stitch in next ch, sk 2 ch, v-stitch in next ch, *sk next 2 hdc, v-stitch in next hdc**. Repeat from * to ** 9 more times. Sk next 3 hdc, v-stitch in 1st chain stitch of left armhole, sk 2 ch, v-stitch in next ch, sk 2 ch, v-stitch in next ch, *sk next 2 hdc, v-stitch in next hdc**. Repeat from * to ** 3 more times. Skip next 2 hdc and dc in next 2 hdc. Turn. Round 15 (cluster round): Chain 3. Dc in next dc, *cluster in ch-1 space of the next v-stitch**. Repeat from * to ** around. Dc in the last two dc. Turn. Repeat round 14, v-stitch (v-stitch in the middle dc of each cluster stitch) and round 15, cluster stitches (cluster stitch in the ch-1 space of each v-stitch) five more times for a total of twelve lace rows. Do not fasten off. Ch 1 and sc up left front working in ends of rounds. Ch 1 and turn. Sc in each sc down left front, making 4 button holes spaced evenly down the yoke (the hdc stitches). (To make buttonholes: from the top, sc 2, ch 2 and sk the next 2 sc. I then worked 5 sc to the next buttonhole and so on.) Ch 1 and turn. Sc in each sc and chain stitch up the front of the left front. Do not turn. Ch 1 and sc in each stitch along the neck. Ch 1 and sc down the right front working in the ends of the rounds. Ch 1 and turn, sc in each sc up the right front. Ch 1 and turn, sc in each sc down the right front. Ch 1 and work picot edging along the bottom as follows: *sc 3, picot** repeat from * to ** around finishing with sc in the last 3 stitches. Attach yarn to underarm. Work 30 hdc around and join with a sl st. Do not turn, but instead continue to work in the round. Ch 2, work 1 hdc in the same stitch and then 1 hdc in each hdc around. Work a total of 4 rows from the join and work a decrease by skipping the first hdc (the one in the same space as the chain) (29 hdc). Work 12 more rows decreasing 1 hdc at the beginning of each round for a total of 16 rows and and final round of 18 hdc. Fasten off. Any questions about how to make this cardigan... just post a comment and I'll do my best to explain it to you. What a darling baby and a darling sweater! So glad you found me and that now I have found you! I wish I could crochet...I am not very good at it. So inspiring to see tiny perfect baby sweaters. 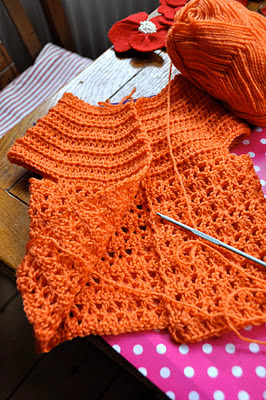 Crochetting is super easy, once you get going, and really quick. Check out some YouTube video tutorials (also Meet Me at Mikes blog does some great video tutorials.